This object is too low to be a stone wall, but meets all the other criteria. It is (or was before the stones dislodged) an abutting (family) stone row (Class) at Beavertail Lighthouse, Jamestown, RI. The class stone row is one of four classes within the stone domain (the others being Stone Walls, Stone Concentrations, and Notable Stones). This class is divided into two families, which are not subdivided into types. 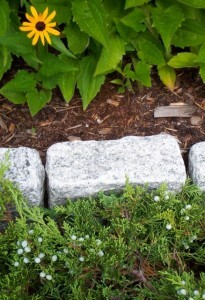 Like stone walls, stone rows must contain multiple stones that combine into either a straight or broadly curved line. 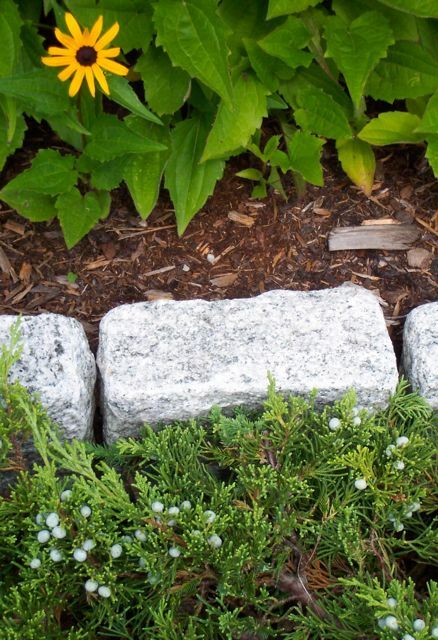 Unlike stone walls, they are either discontinuous (which puts them in the family “spaced rows”) or too low to qualify as a wall (which puts them in the family “abutting rows.”) Most are either blockages for vehicle access or decorative borders. This family of stone row must be too low to be a wall, and the stones must abut one another, making the line “solid.” Most are made of stones small enough to move easily by hand, and are almost exclusively used for decorative purposes in parks, gardens, and homes. The most familiar is the cobblestone or paving stone border along a driveway, separating grass from asphalt, or mulch from yard. Blocks of cut stone, bricks, and jagged stones are used as well. 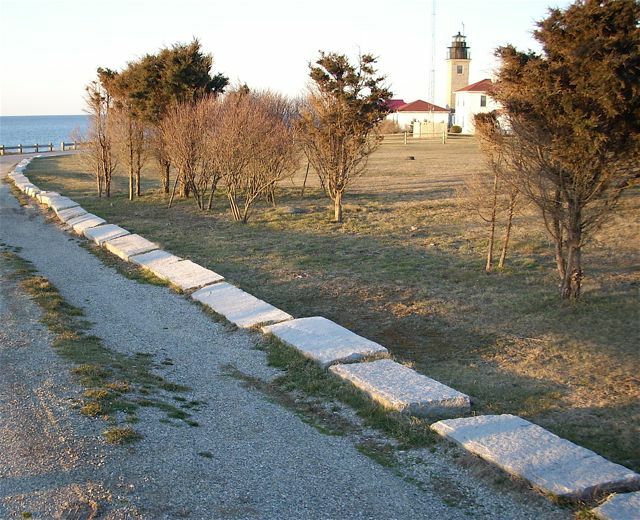 A line of stones that abut each other, yet are too low to qualify as a wall are abutting (Family) stone rows (Class). A widely spaced (Family) stone row (Class) is considered a dotted (Type) row. Ethol, NH. A spaced row is discontinuous, meaning the stones do not touch each other. There are two types, “dashed: and “dotted” rows. The space between the stones must be shorter than their width along the line. An almost randomly placed dashed (Type) spaced (Family) stone row (Class) in Bar Harbor, ME. Cadillac Mountain in background. If these boulders abutted each other, this would be known as an abutting wall because they exceed the knee-high threshold. For the type “dotted row,” the spaces must be wider than the average diameters of the stones. Informally, I use the term cobble-dots for those composed of rounded stones smaller than skull sized. Boulder dots and rock dots are larger, rounded and jagged versions of dotted lines that are so common around sand and gravel pits and in developments where excavated stones were kept for use in vehicle access.